The 23-foot boat’s twin outboard motors leave behind a frothy wake as we cruise out of the sheltered estuary of Hawaii Kai. Rounding the corner out of the bay, the silky morning water turns to small white chops. A lone canoe paddler strokes hunched against wind. Rain clouds blanket the distant Ko’olau mountains in a cold gray mist that has mixed with the ocean spray to coat my glasses and dampen my sweatshirt. My mission today: to catch a fish. The captain sets four lines. The lures, no bigger than a hand span, with big glassy heads and vacant expressions will be our bait. The bottom half of the lure reminds me of squid tentacles, if squids went to raves that is. Skirts of florescent pink, gold, silver and yellow stripes shimmer garishly, the glitter in their rubbery skins catching the light while masking the dull gleam of the hook hidden in their folds. In an hour, I’m adjusting to the vessel’s pitching and rolling. I totter over to the captain, who says we’re looking for bird piles. Groups of frigate birds diving for baitfish usually signal the presence of larger open ocean pelagic species such as the highly prized ‘ahi(yellowfin tuna), mahimahi (dorado) and ono (wahoo). Bbbuzzzzzzzzz. We freeze mid-conversation. One of the poles bends and flexes as the first fish of the day rips line from the reel. “Somebody get on it!” the captain shouts. I grab the handle with one hand and try to start cranking it in. One hand? Not working. I work with two hands alternately throwing my weight forward then pulling back. Line is still spooling out faster than I can bring it in. This must be a monster. I imagine a whale of a fish like the ones on National Geographic’s Wicked Tuna. I’m sweating and cranking and rubbing my face on my sleeves to get the hair out of my eyes. “Here we go, don’t stop cranking until I tell you,” he cautions me. A few minutes later he leans over and with one quick swipe of the gaff hauls in our catch. I’m stunned. The fish slapping around the deck spraying fishy bits all over my feet and ankles can’t be more than 20 pounds. The captain laughs at my puzzled expression. This fish, a koshibi (small ‘ahi) smaller than my dog back home, made me sweat more than any Bikram yoga class ever did. But it is beautiful. Tiny scales fade from iridescent blue to a dark grey and its pointy fins are bright yellow. I try to take a picture, but my arms are shaky from excitement or fatigue. Hair sticks out or flattens to my head in unfortunate places. Fishing is not glamorous. Back in the harbor, the captain filets the smaller koshibi and slides the rich red three-pound chunks into Ziplocs. We are lucky, with fresh local tuna selling for $21.99 a pound at local supermarkets, fish of this quality would have cost me nearly $70. Hawaii residents eat three times more seafood than the national average consumption. However, rises in prices the last few weeks for fresh local tuna means that many residents may be cutting back on island favorites such as poke and sashimi. Severe storms in late February and March kept smaller boats on land and even diminished the supply from longline vessels, which may fish hundred of miles offshore during their 15-20 day voyages. These larger boats account for over two-thirds of the local pelagic (open ocean) fish landings. Prices consumers see at the store are often a reflection of this supply, which is then sold through a largely unseen fresh fish auction happening six days a week at Honolulu’s United Fishing Agency. Competitive open bidding begins at 5:30 a.m. sharp with the traditional ringing of a brass bell. In this chilly warehouse where footwear must be sanitized before entering, groups of men in boots and sweatshirts follow the auctioneer down the rows of neatly iced fish. The auctioneer spews out prices like a horse race announcer, adjusting the price up or down depending on subtle hand signals from the bidders. Established in 1952, the Honolulu fish auction is based on the famous Tokyo fish auction in Tsukiji where fish were bid on individually instead of being bought by the whole catch. “I think from a philosophical perspective this was an incredible idea on the part of our founding fathers,” said Brooks Takenaka, manager of the United Fishing Agency. The fish auction provides a marketing venue for licensed fishermen statewide and a reliable source of fresh fish for restaurants and wholesalers. 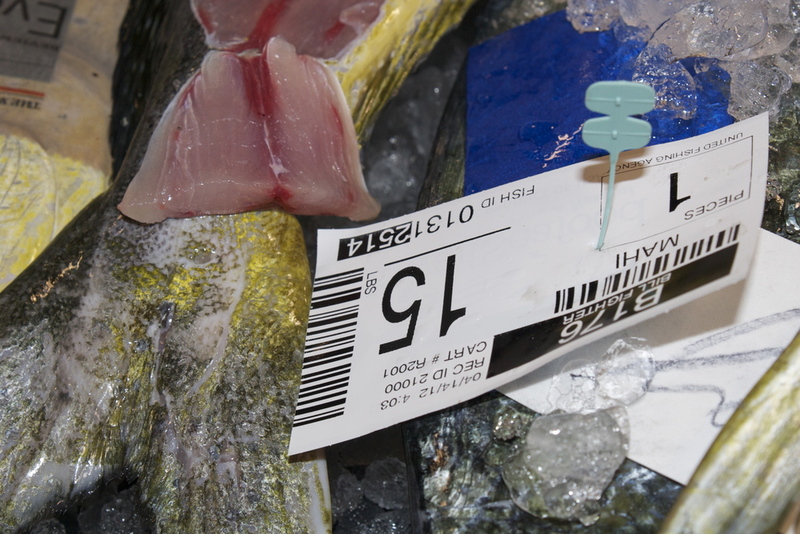 This system is often more convenient for both parties and helps to eliminate unsold fish. “It was a significant part of creating the seafood market here in Hawaii,” Takenaka said. As far as he knows, there isn’t another system that has the variety of open ocean species available at the Honolulu auction. Today’s haul included everything from 100 pounds of quarter-size opihi to the red pancake-shaped opahs to a swordfish so large it needed to be cut in half to fit on the pallet. Although the process looks chaotic, the day was actually relatively mellow with around 70,000 pounds of fish sold in four hours. On their busiest days, normally around the high-demand holiday season, the auction may sell up to 160,000 pounds of fish. The Honolulu auction is unusual in other ways as well. To control quality, workers cut off small sections of the tail to expose the inner meat and allow potential buyers to examine the quality and coloration. Some buyers smell the sample, while others prod it or roll small portions of the oily, omega-3 rich flesh between their fingers. From a young age Takenaka described developing an affinity to the ocean through diving, fishing and torching. Although he and his friends spent a lot of time in the water, Takenaka says they made a point not to do illegal things like spear lobsters or take undersized species. His family, recognizing the difficulty of making a living off the ocean, didn’t want him to be a commercial fisherman. Instead, he went to the University of Hawaii where he graduated with a degree in marine biology. Takenaka believes that his upbringing and scientific background helped establish an attentiveness towards nature and a passion for education and marine research. Watching fishing industry develop over time, Takenaka said he felt a personal obligation to try to do what he could to help the industry. “It’s been tough,” he said. “It’s really a rather daunting task.” However, he points to the ocean pelagic species and bottom fish fisheries as two examples of how regulations and cooperation between the fishermen and the lawmakers can produce a well-managed fishery. Takenaka says his ultimate goal is to get that resource base back to a point where the fishermen can fish all year round again, not just during certain times of the year. While Takenaka and the Honolulu auction have been written about in the New York Times and featured on channels like the Auction Network, Takenaka said he is not trying to gain publicity or even promote visitors on his already crowded floor. (Limiting the auction to just buyers is not something he wants to do.) What he is interested in doing is spreading awareness as to why he and others in the industry feel this is an exemplary fishery. Takenaka believes some of the best environmentalists are the fishermen because they have a stake in the welfare of the fisheries. He also feels that coming from an island state also creates a conscientiousness about conservation. “People don’t understand that these hunters and these fishermen are far more conservative because they need to protect this resource for their own livelihood,” Takenaka said. According to a 2008 report released by Hawaii Seafood Council–a program that supports Hawaii’s sustainable seafood produced by responsible fisheries through research, education, training, outreach, and branding–Hawaii’s open ocean fisheries are 94 percent compliant using the United Nations Food and Agriculture Organization Code of Conduct for Responsible Fisheries. The Honolulu auction helps this process by only accepting fish from registered American boats, which are subject to strict regulations. Rules first set forth by NOAA and the Western Pacific Regional Fishery Management Council require longline vessels operators to participate in monitoring and surveillance programs, mandatory logbook reporting, annual training in protected species avoidance/safe handling, etc. According to Dr. John Kaneko, program manager of the Hawaii Seafood Council, later protection efforts by larger international fishery management bodies, such as the Western and Central Pacific Fisheries Commission, have adopted some of the conservation measures first developed and implemented in the Hawaii fishery. The commission’s vessel monitoring system requires the installation of a GPS-like device that can transfer the location of the boat at any time allowing fisheries managers to ensure that boats are not fishing in closed areas. Although fishermen from Hawaii only account for 3% of the international Pacific tuna longline fishery, they produce over 80% of the independently observed fishing data necessary for science-based management. The United States, the third largest consumer of seafood behind China and Japan, imports eighty-four percent of its seafood. This is up from sixty-six percent a decade ago according to the United Nations Food and Agriculture Organization. Although Hawaii has a reputation for fresh local seafood, the story is still much the same with over 75 percent of its seafood being imported. The introduction of reliable packing materials and air shipment has allowed fresh pelagic fish to enter the Hawaii market from around the world. Fresh tuna comes to Honolulu from the Philippines, Indonesia, Micronesia, the Marshall Islands, Fiji and Ecuador. Mahimahi are flown from Ecuador and Costa Rica. Other fish, such as halibut and salmon from the Pacific Northwest and Alaska, enter the Hawaii market during the summer. “The pelagic situation is one concern because you’re dealing with international and global realities,” said Takenaka. “The basis is money.” The Western and Central Pacific Fisheries Commission estimates that the fishery in this area alone is worth approximately $5 billion a year. Unlike Hawaii’s auction system where each fish can be traced from where it was caught to where it finally ended up, international regulations and enforcement can vary especially in developing countries. Globally, illegal, unreported and unregulated fishing is estimated to account for one-third of the total catch, and illegal fishing is estimated to cost the Pacific region $1.76 billion. For a comprehensive report on IUU fishing visit http://www.illegal-fishing.info/uploads/HSTFFINALweb.pdf. “People are finally beginning to realize the health and well-being of the near shore also means a healthier offshore,” Takenaka said. “Healthy mauka, healthy makai.” And while people in Hawaii may attempt to keep fishing a sustainable industry, the reality still remains that managing a highly migratory and profitable resource in international waters poses many challenges.